Home Incidents You Must Pay For The Service You Acquire. 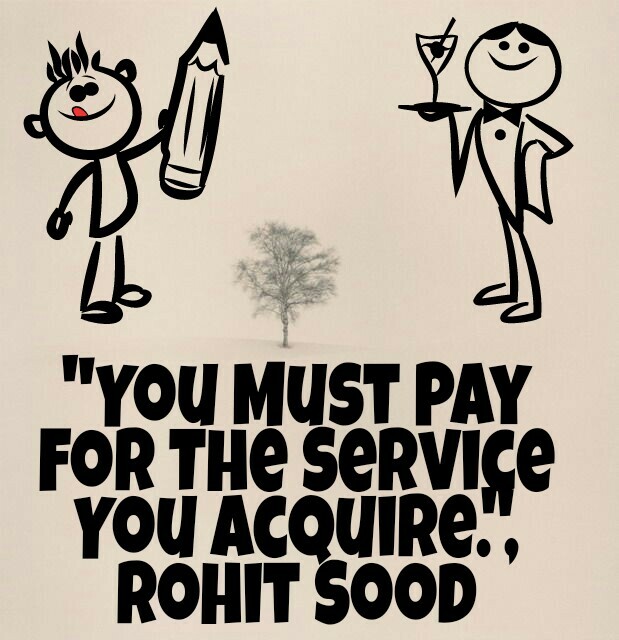 You Must Pay For The Service You Acquire. Today morning, I boarded an Auto-Rickshaw from 'Chigiti By-pass' towards PAP chownk. When we were about to reach PAP chownk, a police man stopped the auto, near flyover in front of PAP gate, and entered in it. Finally when we reached PAP chownk, he said, "I was getting late, thanks for getting me here" and ran out of the auto (without paying). Meanwhile, I came out of it and when I was paying my charges, I asked the auto driver ,"Ehne k de paise nai lagde? (If this short route is not chargerable.)" "Lagde aa, par eh dinde hi nai. (It is chargeable but they don't pay. )", he replied. From his voice I sensed something and asked another question, "Long route te v nai dinde? (Don't they even pay on long routes?)" "Naa!! Isiliye assi bathayide hi nahi.. (No, they don't, so we don't make them sit. )", saying it, he departed.